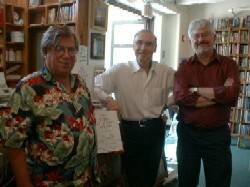 Shelly and Jim gang up on Bob during his annual visit to the Mystery Book Store in Westwood, CA. 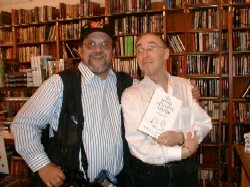 The store is among the most popular stops for touring authors in the Greater Los Angeles area, while Shelly and Jim are active members-supporters of the SoCal chapter of the Mystery Writers of America. Roger Karnbad, the dean of Show Biz freelance photographers (and they don't come any better than Roger), one-stopped on his way to a celebrity gala in Beverly Hills. This time he was in front of the lens, with Bob's wife, Sandra, doing her usual duty on the handy-dandy digital.